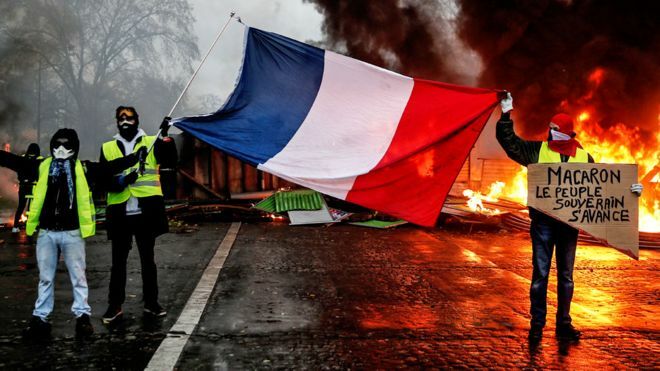 The Arc de Triomphe war memorial was sacked, dozens of cars torched and shops looted by the radical fringe of a three-week-old rebellion over taxes and inequality. Interior Minister Christophe Castaner on Friday vowed “zero tolerance” towards those aiming to wreak further destruction and mayhem during a new round of protests set for Saturday. Shops around the famous Champs-Elysees boulevard – epicenter of last week’s battle – were busy boarding up their windows and emptying them of merchandise on Friday. The operators of leading museums and landmarks, including the Eiffel Tower, Arc de Triomphe, Louvre and Musee d’Orsay all said they would be closed on Saturday, along with department stores, operas, theatres and libraries. The U.S. embassy issued a warning to Americans in Paris to “keep a low profile and avoid crowds,” a warning echoed by the Turkish foreign ministry for Turkish travelers. The Belgian foreign ministry advised Belgians planning to visit Paris over the weekend to postpone their visit. But the “yellow vests,” who have become increasingly radicalized, are holding out for more. The government has vowed a tough response in the event of further trouble. Calls on social media for protesters to attack the police or march on the presidential palace have particularly rattled the authorities. Prime Minister Edouard Philippe said 8,000 police would be deployed in Paris out of 89,000 nationwide, and that a dozen armored vehicles would be stationed around the capital – a first. The “yellow vests”, named after the high-visibility safety jackets worn by demonstrators, began blocking roads, fuel depots and shopping centers around France on November 17 over fuel price hikes. Opposition parties, particularly on the far right and radical left, have sought to capitalize on the protests to try to bring about Macron’s downfall. The protesters accuse the centrist president of favoring the rich and city-dwellers over those trying to make ends meet in car-dependent rural and small-town France. Macron’s “cardinal sin,” in the eyes of the protesters, was to slash wealth taxes shortly after taking office. But his climbdown on fuel taxes – intended to help France transition to a greener economy – marks a major departure for a leader who had prided himself on not giving into street protests. Prime Minister Edouard Philippe has signaled a willingness to make further concessions. Parliament speaker Richard Ferrand said the president did not want to “add fuel to the fire” in the run-up to Saturday’s demonstrations.